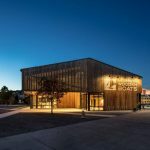 After more than four decades of operating from its small boathouse on the shores of South Lake Union in Seattle, Washington, the Center for Wooden Boats (CWB) is expanding with its new Wagner Education Center. 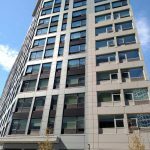 New Jersey’s 3 Journal Square, a mixed-use, 240-unit apartment building, hopes to attract young professionals with a high-style aesthetic, modern performance, and Leadership in Energy and Environmental Design (LEED) Silver certification. 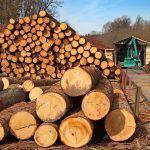 The U.S. Green Building Council (USGBC) has launched a new Leadership in Energy and Environmental Design (LEED) pilot credit designed to increase transparency in timber supply chains and reduce the risk of illegally harvested wood entering the buildings industry. The Timber Traceability credit is designed to up efforts to eliminate the use of illegal wood in buildings. 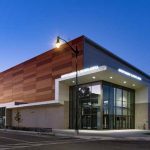 IMPs create a sleek look for sports complex in Washington D.C.
Washington D.C.’s Entertainment and Sports Arena (ESA) is a state-of-the-art, Leadership in Energy and Environmental Design (LEED) Silver-certified, multipurpose entertainment, sports, and cultural complex. 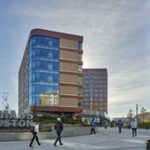 The insulated metal panels (IMPs) used in the 109,63-m2 (118,000-sf) enclosure provides a sleek look, while also offering a seamless addition to the nation’s capital.